This is the best light I have owned and significantly brighter than the model down. Only complaints (1) I wish it would last longer in 900-lumen mode. (2) I wish it charge quicker. But it matches my bike. Life is trade offs, you know? great price for the amount of lumens. This is easy to recharge and very bright. Multiple settings make it easy to adjust day, twilight, and night riding. One frustration I have had is lights that are brighter than needed for twilight or riding where there are street lights but not bright enough to see where it is unlit. This light fixed that! Excellent lights and is smaller than my last Nightrider 700. Wish it flashed, pulsing doesn't grab the attention needed in city riding. Brightness is fine battery is great. Also has interference with wireless speedometers. Great light for long tunnels on bike trails. Haven't tried it for night riding, but it is brighter than anything i used when I commuted. Very bright for its size, rechargeable, lightweight, compact, and easy to attach and detach. The perfect light for my rides through local rail-to- trail tunnels on a gravel bike. I will be putting it on my road bike for those late afternoon club rides in the Fall. a great partner for the Motion rear light. Early morning commutes and evening rides. This is the second L&M Urban light I've bought, the first is an older 800. Both lights work well and hold a charge that (as near as I can tell) meets the specs. I ride a couple mornings a week starting out in the dark and in an area with little or no street lighting. I have mounted the 900 on my helmet and the 800 on the handle bars. This setup provides all the light I need to ride the dark streets and bikeways. I typically set both lights at the highest setting because my ride is a little more than one hour so I don't need a lot of battery life. But, I've found that the next lower setting on both lights provides adequate light as well. I routinely need to move the handle bar light from one bike to another so the easy onoff rubber strap is a plus for me. I do need to point out that the Urban 900 I bought did NOT come with a helmet mount. I am using the mount that came with the Urban 800 so it isn't an issue for me but something potential buyers need to know. I really love this light, works great in daytime, great at night and I only use the highest brightness setting while on really dark unlit bike paths. the only few is I don't like the little screw that tightens the light the GoPro mount, it's hard for large hands to use and I never feel like I got it on properly. it's never come off or been an issue it just doesn't feel as solid as the rest of the light. the light itself has great battery life and beam spread and seems very rugged. I would by another if needed. love it, works great. very bright. battery last a good long time, I've used it on a century ride and had plenty of life left in it. 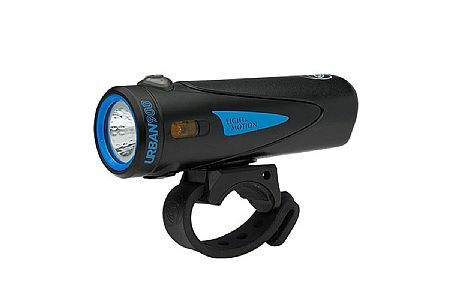 I recently bought the Urban 900 light to replace an older non-L&M light. I already have a L&M Urban 800 that I am satisfied with (2.5 years old) and so chose the 900 as my second light. My intent was to mount one Urban light on the handle bars and the other Urban light on my helmet. I find this setup optimal for riding at night in poorly lit areas andor on trails. I was surprised to find that the Urban 900 did not come with a helmet mount. I had not given it a thought at ordering because my Urban 800 had come with a helmet mount. Fortunately one helmet mount is all I need and, it will work for both lights. Re-reading the description of the Urban 900 I do see that it does not say that a helmet mount is included so I can't complain too much. Light and motion has the bike light down for the most part. The size, power, and burn time are all top notch. This is bright enough for single track and must be turned down and aimed down a bit for night time commuting. The clamping has proven to be mostly drift free since the strap is at the balance point. The strap, initially suspect, is easy to mount and remove to make charging and security easy, and has held up for a very long time on my both my current one and my old urban 300 that I must have been using for 5 years or more. Of special note, the current dimpled reflector results in the smoothest best distributed lump free lighting I have ever seen. There are no hot spots or shadows, and the illumination drops off smoothly from center to edge. Unfortunately, although I bought this to replace the 300, it is almost never used because Light and Motion has eliminated the most important mode for my use, the day time flash. Back in the late 70's or early 80's, the USDOT made an observation that flashing lights on barricades were attracting drunks at night instead of warning them away, and resulting in the barricades being hit very often. To the best of my knowledge this is the only published study on flashing lights and traffic. Light and Motion has extended this to bike lights, non-drunks and daylight. Virtually all of my riding is in daylight and often in traffic. With the 300 in flashing mode, I do not get people pulling out from side streets in front of me, making left hand turns in front of me from the opposite direction, or pulling onto the shoulder to make a right hand turns as I approach from the rear. In addition, on mountain, country roads, going from sunlight to shade, even with dashboard glare, I am seen and avoided. I do not mean that the flasher reduces the problems, I mean the it eliminates them. Now all I worry about it the guys who don't like bikes approaching from behind. As such, I feel that a flashing headlight is the most important piece of safety equipment that you can have on a bicycle.